The launch of China's fourth human spaceflight this weekend kicked off a major docking test flight, and there's a chance you can see the two spaceships involved in the orbital rendezvous in tonight's night sky. China's Shenzhou 9 space capsule launched into orbit Saturday (June 16) with a crew of three astronauts aboard, including China's first female spaceflyer Liu Yang. The crew's mission is to rendezvous with China's existing space laboratory module Tiangong 1, which has been circling Earth since its own launch last September. The two spacecraft are expected to dock for the first time on Monday (June 18), which means that if you live in a part of the world that is along the Shenzhou 9 mission's flight path, tonight is your last chance (weather permitting) to see the space capsule and Tiangong 1 orbiting lab flying separately before they link up. First, some tips: Keep in mind that the key to spacecraft viewing from Earth are dark skies (away from bright city lights), clear weather and good planning to know when and where to look to see the vehicles. Satellites and manned spacecraft often appear as bright pinpoints of lights that move quickly across the night sky. The International Space Station, for example, is the largest human-built structure in space and can appear so bright in the sky that its brilliance rivals that of the planet Venus at times. Since the Tiangong 1 lab and Shenzhou 9 capsule are smaller than the space station, they will likely not appear as bright. The following three websites are good starting points to determining if the vehicles involved in the Shenzhou 9 mission may be visible from your region. Each site will ask for a zip code or city, and then respond with a list of suggested spotting times. The predictions are computed a few days ahead of time are usually accurate within a few minutes. But they have been known to change, so be sure to check frequently for updates. Another good resource is the website Real Time Satellite Tracking, which shows which part of the Earth a wide variety of spacecraft happen to be flying over at any given moment during the day or night. China's 13-day Shenzhou 9 mission will dock twice at the Tiangong 1 space lab, first in an automatic mode and then again in a manual mode, to demonstrate spaceflight rendezvous technology. 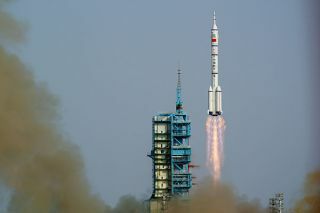 Chinese space officials have said the test flight is vital to the country's plans to begin building a full-fledged space station in 2020.